Extensive Folding in the Rock Strata is visible here. 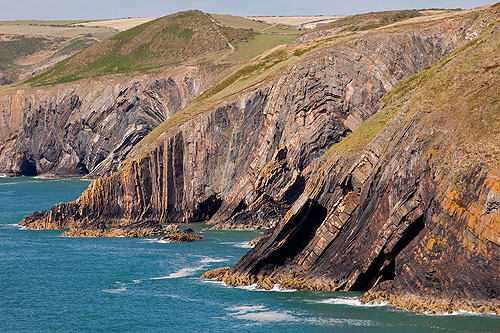 The Rocks (up to 1300metres thick) , between Dinas Island and Cemaes Head , are classed as Turbidite Sandstones and Mudstones . Sedimentary Debris - Sand, Gravel and Mud - accumulated in great banks, about 440 million years ago , forming unstable masses above the slopes leading down into the deeper water. Frequently, large portions of these sediment masses would slide, at first slowly and then, as they gained momentum down the slope, as colossal fast-moving submarine avalanches. These fanned out to cover vast areas of the seabed, time and again, layer upon layer. Every Sand-Silt-Mud sequence representing a single submarine avalanche. These deposits were layed down over a short period of a few years . The Strata was Folded and Faulted during the Caledonian mountain building period (Orogeny) , about 400 million years ago.